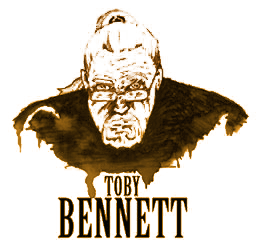 Toby Bennett was born in 1976 in Cape Town, South Africa. He holds a degree in philosophy from the University of Cape Town. Like many writers he has had a varied career that has included graphic and web design, database administration and technical writing - and if you think you're bored by that try living through it! His true passion lies in creative writing and to date he has written twelve novels and appeared in various collections of short stories.